40mm Knotty Pine Jointed-Board - Solid timber Worktop 1450x650x40mm :­ "Contract Quality"
Pine is a natural product - Knots, colour and grain can vary from one worktop to another - They are not defects. 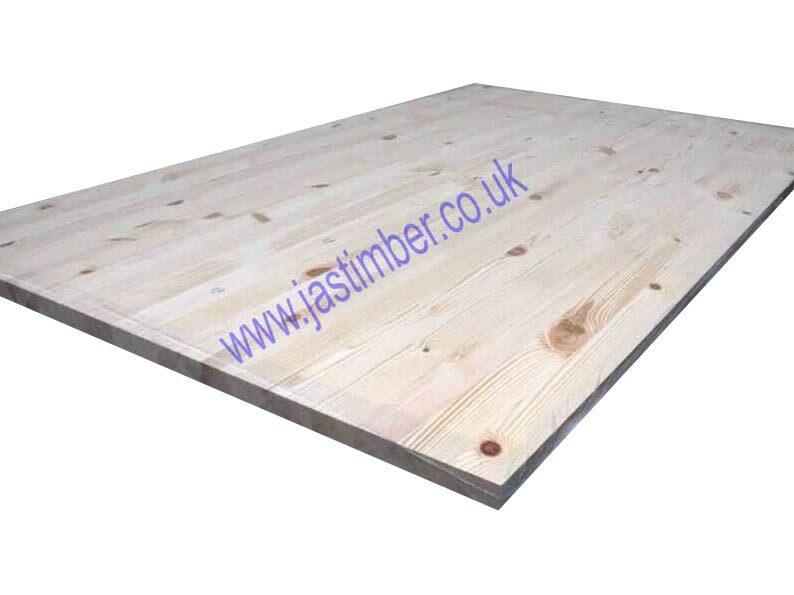 1450x650x40mm Pine solid timber Jointed-Boards - Solid-Pine finger-jointed timber staves can be 40mm to 60mm wide by 40mm thick. Pine is a softwood and isn't as hard or dense a timber as Oak, Iroko or any of the Hardwood Timbers that Kitchen Worktops are normally made from; It isn't as expensive either, so to an extent, you get what you pay for! The key to a long lifespan for your Pine Worktop is treatment, and plenty of it! You would need to give 5 or 6 six coats of a Danish Oil treatment to both faces, all edges, and any cut-outs. Pine Worktops need to be fixed in place before any movement starts to occur in the timber; The worktops need to be fixed firmly enough to stop any cupping or twisting the is prevalent in boards that are as wide as this. the treatment for your Pine Worktops needs to be maintained - sanding down and another 2 coats per year is recommended. "Contract Quality" means that this "Pine Worktop" is sold as a Solid-Pine Jointed-Board, ideal for use as worktops, desktops, shelving and solid panelling, where the Pine Jointed-Board can be fixed solidly in place, and used in a normal domestic environment, in a dry area. If you wish, you can use these as kitchen worktops by a sink, but this would be at your own risk, with no guarantee if the worktop did get wet. - We cannot be held responsible for any variations in machined 40mm Pine Board sizes, pattern, grading, moisture content, treatment, certi­fica­tion, knots, colour or grain. - We cannot exchange any Timber Worktop after cutting; 1.45 metre Pine Timber Worktop is cut specially and supplied as a Special Order. 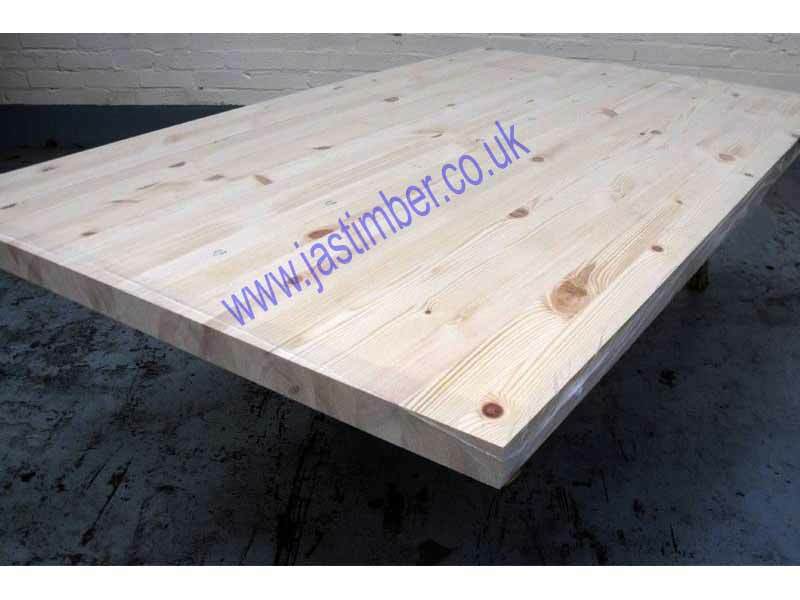 A Contract 1.4 Metre Pine Worktop can be ordered online; Just add to basket which calculates carriage by weight. E. & O.E. see T&C - We do try to keep prices and specifi­cations of 1.5 Metre Solid Pine Worktops correct, but mistakes can be made!